We open with Tae Ik visiting his parents’ grave. He recalls when his father first brought him to Full House. Tae Ik was in awe and wonder. That’s their home! Does he like it? Tae Ik says he does and his father says it’s a present from him and his mother. The flashback ends and Tae Ik starts crying. He apologizes to his father. I’m guessing because he’s choosing Man Ok over his childhood home? The emotionally drained Tae Ik goes to his car and gets in. He closes his eyes and sighs. He recalls Man Ok getting beaten while a crowd watched on, Joon’s words that there was no way Tae Ik could stop him, and Kang Hwi’s words that he can do nothing since Tae Ik is only Joon’s puppet. He opens his eyes and checks his phone. 32 unanswered calls. Yikes. We then cut to the hospital scene we ended with. Kang Hwi wishes to buy Man Ok a nice meal, but she says they should eat in instead. He touches her wounded face saying he hopes it won’t scar. Man Ok smiles and says it won’t as she has good skin. She then answers the desperate call from Go Dong asking if Tae Ik is with her since he hasn’t shown up yet for the press conference and isn’t home. Joon is freaking out and yelling at Go Dong to quickly find the missing Tae Ik as it’s past show time. Joon apologizes to the reporters since they have been waiting for over an hour. As he is about to explain the situation, Tae Ik arrives. Joon apologizes for the delay and Tae Ik comes up on the stage and bows deeply. He sits down and firstly apologizes for making them wait so long. He then reveals he didn’t come to release his solo album, but to release the truth. Joon’s smile falters and he looks worried—especially when Tae Ik says he will release the truth about the contract engagement news that everyone has seen. Tae Ik says the article is true and he deceived everyone. Uh-oh. Man Ok and Kang Hwi are in a taxi heading to the press conference. Kang Hwi warns her its better not to expose herself to the media, but Man Ok can’t help it as she’s really worried about Tae Ik. She then gets a call from Go Dong telling her not to come as there will only be trouble. We cut back to the press conference where Tae Ik says everything is his fault and Man Ok has nothing to do with it. He will bear full responsibility and leave U Entertainment. In this uproar, Tae Ik gets up and leaves while Joon looks like he’s having a breakdown. He chases after Tae Ik and grabs the young man. Is he crazy? How could he do that and stab Joon in the back? Tae Ik says he will no longer be Joon’s puppet. Doesn’t Tae Ik know how bad the breach of contract is? Is the younger man confident he can take care of it himself? Tae Ik brushes off his arm and says that he will give the annex up to take care of contract cancellations charges. Doesn’t this show that his feelings for Man Ok are more than his feelings for evil Watermelon Snowflake Se Ryeong? He couldn’t give up the house for her, but he can to save Man Ok. Heeeheee. Joon asks if Tae Ik is really going to give up everything and leave? Tae Ik says he isn’t giving up at all, he’s just not using Joon any more to get what he wants. Man Ok and Kang Hwi arrive after it has ended and overhear a reporter talking about the headline being “Tae Ik’s Mandatory Withdrawal.” This shocks both of them. Man Ok then rushes off to Full House because that’s the only place Tae Ik would go. She leaves Kang Hwi who gets spotted by Joon. Does Kang Hwi have any idea how long Joon was looking for him. Angry glare. Kang Hwi demands to know what Joon wants. Joon smiles and says he wants to clean up their “misunderstanding.” Misunderstanding? Whatever. 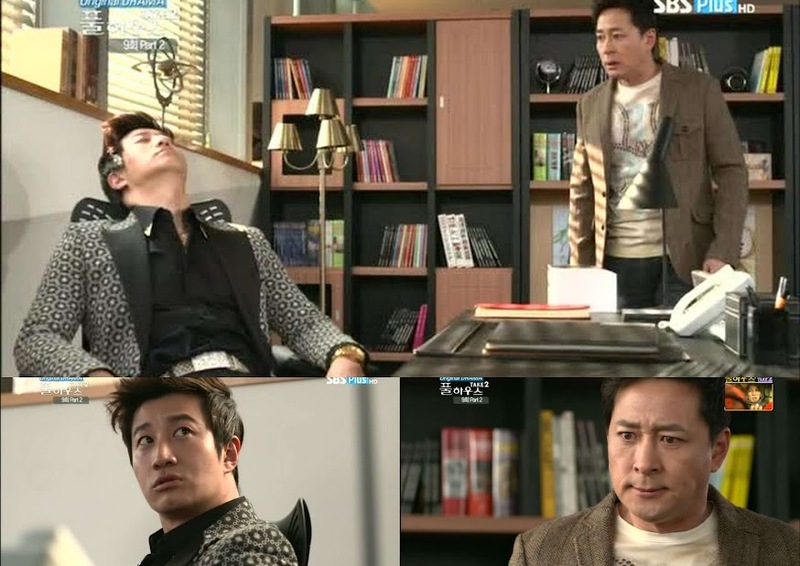 Joon then demands that Kang Hwi return to him immediately. Kang Hwi says losing Tae Ik like that must have scrambled Joon’s brains. How long ago was it that Joon spat Kang Hwi out like chewed up gum? Reinstate him? Kang Hwi says he’s crazy just talking to Joon. He goes to walk away and Joon tells him that he’ll be blind in a year. Kang Hwi turns around—not believing this. Joon says that he can show Kang Hwi the results of his tests. Kang Hwi doesn’t want to go out like this, does he? Kang Hwi, like Tae Ik, says he doesn’t need Joon and hobbles away. Joon smiles after him. Kang Hwi will return to him. Tae Ik gives the house one final look and gets in his car and drives away as Man Ok arrives in a taxi. She rushes into the house, but Tae Ik is already gone. His room remains in tact, but his closet is empty. Man Ok drops to her knees, fighting back tears. Bum Soo who is escorting Se Ryeong then gets a call from Joon that shocks him and he rushes into the office. Is it true Tae Ik left on his own? Just what did Joon do to these kids? Joon tells him to leave as he has a big enough headache, but Bum Soo is NOT letting it go this time. Joon warns him that he only lets it go once, but Bum Soo continues. How long will Joon treat these kids like consumables? Has Joon ever treated them with sincerity at all? They come placing their faith and trust in Joon and how does he repay that? Joon turns to look at him. Emotional sincerity? Bum Soo doesn’t do his job properly thanks to that sincerity. Bum Soo glares at him and Joon says this is his last warning. Bum Soo needs to rid himself of this sincerity and do as he’s told without talking back. If he can’t do that, he can leave Joon, too. Bum Soo then says no one knows what life will throw at you or what the future will hold. How long does Joon think he’ll be in his current position? Hehehehehe. I love Bum Soo. This gets Joon to his feet and he screams (okay, just plain old yells) at Bum Soo to get out. Bum Soo takes this all in stride. Fine, he’ll leave, but before he does, he’ll give Joon one last warning. Ooooh. He’s throwing Joon’s words back at him. Joon shouldn’t be like he is, struggling to gain money and stamping on others for his own personal gain. Why? Even this business, as harsh and cold and evil as it is, is run by PEOPLE (emphasis mine). Bum Soo smiles and leaves the fuming Joon who wipes his desk clean in one sweep. Bum Soo walks out and there stands Se Ryeong. He looks at her and says “evil b*stard” and walks away. Snowflake smirks and goes into the office where Joon is still fuming that Tae Ik stabbed him in the back to protect Man Ok. Se Ryeong can’t believe that Tae Ik did that solely for the other woman. Who is she anyway? Joon looks at her…just who was it that told the reporters about the contract engagement? Se Ryeong looks away guiltily. Haha. her plan majorly backfired. Kang Hwi is drowning his sorrows at the bar. He points to the shot glass and says he can see it. He can see everything perfectly fine. He then overflows the glass as he recalls the specialist’s words confirming that he will most likely go blind shortly. The doctor tells him that he might retain some vision, but it’s difficult to guarantee in Kang Hwi’s case. Our drunk star is out walking when he comes across a video of him of Tae Ik performing on a music show. He then starts singing to their song drunkenly and a crowd gathers as he sings louder and starts crying. Uh-oh. People are trying to figure out if he’s the real deal or a look alike. Poor bunny is having a mental breakdown. Bum Soo, Go Dong, and Man Ok are out drinking. Go Dong is not happy to learn Bum Soo tendered his resignation. Bum Soo replies he can’t see the kids get hurt like that anymore. When Go Dong vows to quit as well, Bum Soo tells him to stay and learn the business as much as he can and Bum Soo will come to get him as soon as he is able. Awww. Feel the mentor love. Man Ok then says she’s sorry to bring this up right after he quits, but she must find Tae Ik. She figures Bum Soo will know where Tae Ik could have gone. It’s all her fault, you know. Bum Soo asks how it is her fault when it’s all Joon’s doings. He sighs and wonders himself where Tae Ik went. This surprises Man Ok—he doesn’t have any ideas? Well…Bum Soo can’t think of a single place Tae Ik could go. The drunk Go Dong then puts his glass down and says he’ll help her, too. Man Ok then asks him for the numbers of Tae Ik’s “close friends.” There is no such thing. Tae Ik is all alone—hasn’t she figured that out yet? Basically…it’s Bum Soo, Go Dong, Kang Hwi, and Man Ok that Tae Ik has and no one else. Go Dong tells her there is nobody who comes to mind except Kang Hwi. Go Dong then wonders what wrong Kang Hwi did to be ousted. Go Dong then starts crying about poor Kang Hwi who did nothing wrong and was forced to leave. Aish. Kang Hwi is drunkenly stumbling about. How he avoided getting hit by a car when he was walking down the middle of a road is beyond me. Anywho, he comes to a bridge and starts crying. Awww. Makes you want to hug his pain away. The next morning Man Ok is back at her studio sleeping when she is woke up by her phone ringing. It’s Bum Soo. He then asks if she has a passport. Man Ok replies she does, but why? She needs to pack a bag and get to the airport pronto. Huh? Bum Soo then reveals he’s managed to find Tae Ik. Say what? Where is he? We cut to the airport where Tae Ik is dressed rather well given his last airport fashion was a tuxedo. He is in Japan! He goes to the place where his mom works. So, only his daddy died. Mrs. Lee is happy to see her son. She pulls him into a hug and he asks if she’s been well. She says she has been and asks if he has been, too. The two then go inside with another woman and Mrs. Lee asks if Tae Ik has come to Japan to take her home. Ouch. More of an ouch is when his mom asks when his dad will come. Looks like Mrs. Lee is no longer in her right mind since she thinks her husband is still alive and well. Mina is then sent out of the room. The other woman tells Tae Ik that she’s gotten better and there are days when she’s in her right mind more and more. Tae Ik then apologizes for not calling often after he left his mother in her care. She tells him not to say that as she is Aunt Lee’s younger sister before Tae Ik’s mother. Aunt Lee then asks if Tae Ik is there because he got leave. Tae Ik lies and says that’s right. He wanted to see his mother and cool off. Aunt Lee is happy and tells him to take a rest. She cleans out the room he likes and takes him to it. He sees the newspaper article about him leaving and Aunt Lee hurriedly picks it up. So she knows he’s lying. Sweet woman. Tae Ik goes out for some much needed fresh air and recalls what happened five years ago. He brought his mother to Japan to stay with her older sister. At that time she was really out of it saying they need to go back to his father. Tae Ik then tells her she must stay with her sister for awhile. Why is he saying that? What about their house and Mr. Lee? This has both Tae Ik and Aunt Lee crying. Poor Mina doesn’t understand why they are acting like this. Why does this always happen in dramas? It’s a bit annoying and a very overused plot to have mothers mentally breakdown. Tae Ik is out walking and people recognize him. They ask if he’s Tae Ik. He lies and says he isn’t, but they don’t believe him and start chasing him. He’s soon surrounded by a gaggle of fans with phones. His mother comes and sees him and screams. She then starts panicking. These people came to take their house away didn’t they? The girls start taking pictures and Tae Ik hides his mother behind him telling them not to take pictures. He then yells at them. Seriously. That’s just wrong. Not what Tae Ik did, but what those fan girls did. Tae Ik and his mom go out to a pond and fee carp. There used to be a lot of carp at their house. But Tae Ik was never afraid of them. He smiles and says he is now at how they gather like that. Mina then tells her son quite lucidly that she is frightened of people as well. She then asks if they can go back yet as she’s hungry. Tae Ik gets up and holds out his hand. Mina asks if the people might still be there. He smiles and says they won’t be so they should go back and eat. They get to the restaurant and Tae Ik is shocked to see Bum Soo acting as a host at the door. Then Man Ok rushes out with a tray saying the place is packed. This shocks him even more. Man Ok smiles happily at him. He’s found at last. They are so cute! Looking forward to more cute moments with our OTP now that they have been reunited and Man OK learns everything about Tae Ik’s painful past. This espoide is so sad Tae Ik,Kang Hwi and Man Ok and Go Dong and not Bum soo but he quite his job Tae Ik and Kang Hwi are luckily to have friends like them….Joon and snowflake got what they deserve it must hurt her since Tae Ik didn’t give up full house when she ask him but he did it for Man Ok…Is she blind can’t she see that Tae Ik like Man Ok and meaning by blind poor Kang Hwi going blind in a year he drunk and singing I just want to hug him and I don’t think he will I think Joon is lying to get him to work with him again. No, because Kang Hwi went to the doctor to confirm Joon’s statement & learned it was true. It’s sad, but here’s hoping the boys will move on from being Joon’s slaves & can be happy from now on with their new family of Go Dong, Bum Soo & Man Ok.
this show is getting gloomy and sad and I don’t really excited about it…I want more Tae Ik and Man Ok cute scene also Tae Ik and Kang Hwi bickering scene. It’s nice to have some more level scenes and not just complete goofiness. But I hope we don’t stay to horribly serious as the comedy really makes this show. LOL. I think death is a little extreme. I’d settle for a completely destroyed career so she can realize she’s really not all that. See, I still say the writers didn’t develop the characters well when its said someone is supposed to genuinely like someone else, but then you NEVER see any genuine affection only affectation. Ah, this star is SO annoying. I LOVE how she can’t handle that Tae Ik left show biz for Man Ok which meant giving up reclaiming his home for the time being. Poor Kang Hwi, left in Korea while everyone else takes off for Japan! Man Ok did not even think to call him, did not think about him at all that night when everyone was drinking. And Man Ok, what is her reason for following Tae Ik to Japan? Did she think about it or is it another of her “act first, think later” gut reactions. Does she think he needs protecting? And why Tae Ik more then Kang Hwi? (can you imagine taking off for a foreign country and having an employee just show up out of the blue?) She must have a need to be by him all the time, good thing it is reciprocated. Yes it was a sad episode but it was a good one too. Man Ok followed him because she’s already in love with him and just doesn’t realize how much she likes him. So she followed him because 1) she was worried, 2) she thought it was her fault 3) she’s madly in love with him. But the way you put it…yeah, doesn’t it seem really strange and stalkerish? I always hate how our pitiable 2nd male leads get ignored (and sometimes the female leads when the male lead originally likes someone else) and forgotten about. Poor Man Ok and the manger duo totally forget about Kang Hwi-nim. Poor, poor guy. I hope you have a good week as well. The recaps may be delayed due to holiday and family commitments, but will probably be up during the weekend after everyone has returned home. So true, K-drama is always like that. That’s why they name it “the 2nd lead male”. I prepared for Kang Hwi,too. Despite all his happiness outer personality in the beginning, I’m sure asap he will get ‘the series unfortunate event’ —-> he won’t get the girl, his eyes will go blind (he has problem with his feet), etc etc. The most poor thing is, no one will ever care about him, even the audience. This episode is totally tearjerker, my heart cries for Kang Hwi when he cried on the bridge. I google and found your blog on first place. I enjoy reading your recaps. Thanks! It’s funny. Kdramas treat the female lead and the 2nd male lead the worst usually. I don’t get it. I feel badly for Kang Hwi, but here’s hoping Ming Hwa’s arrival will mean something. I’m getting frustrated at that end since they haven’t been developing that plot much since her introduction a few episodes back. can u attach screen caps with every situation !!! I’m trying to get them down, but it’s slow and my goal is to get the recaps written at least. Some days that’s all I have time with work and real life. They will be up. It’s just taking me longer than I would like.